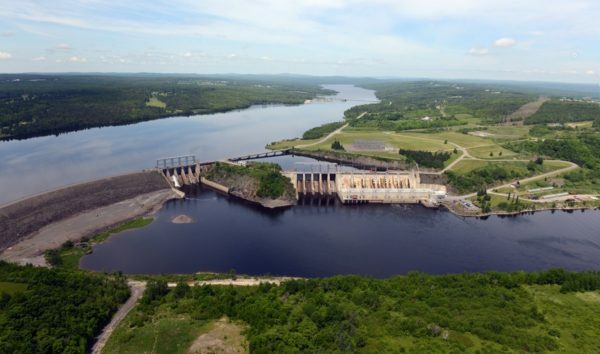 The Mactaquac Project was a three year project that was reviewing the structural, economic, social and biological options for a 670 MW hydroelectric dam on the Saint John River near Fredericton, NB. First constructed in 1968, the concrete portions of the hydro station had been affected by a chemical reaction called alkali-aggregate reaction since the 1980’s. This reaction caused the concrete to swell and crack and has required substantial annual maintenance and repairs. During the 2015 conference, the project was engaged with public consultation about the options using the information gathered to date. 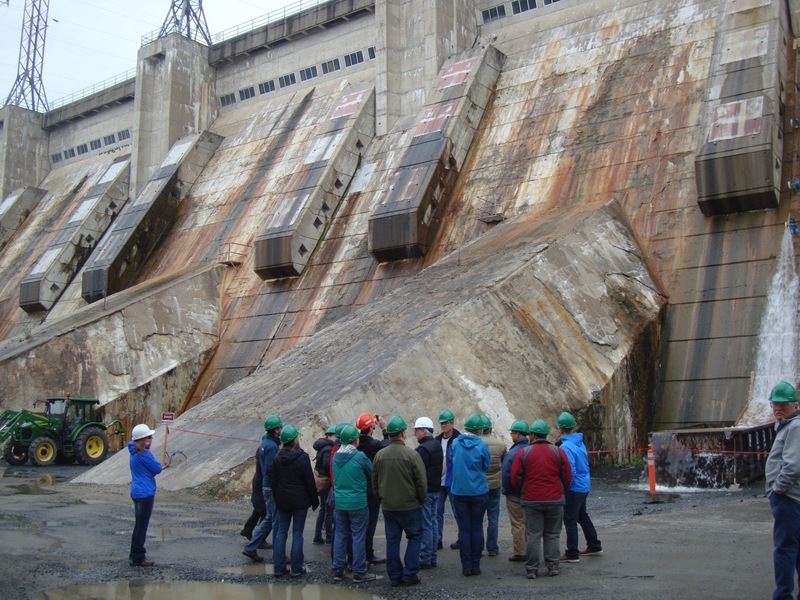 Members of the Mactaquac project made three presentations at the conference and then conducted a field trip the day after the technical talks. The generating station complex contains the generating station or powerhouse, an embankment dam consisting of a rock-filled structure sealed by clay and two concrete spillways, which form an arch across a narrow section of the Saint John River. The complex rises 40 metres in height above the river level, creating an upstream reservoir (referred to locally as the “head pond”) that covers 87 square kilometres and extends 96 kilometres upstream, near Woodstock, NB. The dam and powerhouse complex are a “run of the river” design, meaning that the reservoir has no additional holding capacity in the event of unusually high water flows, such as during the spring freshet. This water is passed directly through the spillways via a procedure called the “opening or lifting of the gates”. During the spring freshet, this event itself is worthy of a viewing from the south side of the river. The Mactaquac Generating Station has a fishway to catch salmon and transport them upriver. An Atlantic Salmon fish hatchery is located immediately downstream from the dam. The dam also serves as a locally important public road and bridge across the Saint John River, linking provincial highways on the south and north sides of the river. Maintain the current facility until the end of its planned life in 2068 through various means of rehabilitation. “The rest of the story” has been extracted from the corporate website http://www.nbpower.com/en/about-us/projects/mactaquac-project. In December of 2016 NB Power announced its decision to pursue Life Achievement – the option to maintain the current facility until the end of its nominal planned life in 2068. The recommendation balances financial, technical, social and and environmental considerations while respecting NB Power’s mandate to provide safe, reliable energy to New Brunswickers at low and stable rates. Because NB Power is a regulated utility with cost-based rates and an obligation to serve embedded in legislation, considerable attention was given to economic analysis of each option. The utility calculated total costs for NB Power under each of the various scenarios over a 100+ year timeframe (2030-2130). This included, for each option, capital costs, contingencies, operational costs, decommissioning costs, site costs and replacement operation costs (energy and system requirements). All options had to assume that NB Power would continue to meet New Brunswick’s Renewable Portfolio Standard in which 40 percent of in-province load is met by renewables by 2020, of which Mactaquac provides approximately 12 percent. The NB Power recommendation was to ensure the station could operate to its intended 100-year lifespan with a modified approach to maintenance and adjusting and replacing equipment over time. Maintaining this facility until 2068 had the lowest overall utility cost and the therefore the lowest long-term pressure on customer rates compared to the other options under consideration. Installation of multi-species fish passage. The specific approach to be taken for each item will be based on the results of on-going studies and detailed planning to define how existing concrete structures and their associated mechanical equipment could be maintained as operational, repaired as necessary or partially or fully refurbished in place. The majority of these activities are expected to take place between 2020 and 2036, pending regulatory approvals. Continued study of multi-species fish passage considerations by the University of New Brunswick’s Canadian Rivers Institute in support of work on a fish passage plan which will be subject to approval by the Canadian Department of Fisheries and Oceans. Read all the details about the project here.